The tech-savvy artists over at Graffiti Research Lab hacked together a large-scale tagging projector using a standard notebook computer, 5000 ANSI DLP projector, a 60mw green laser (apparently super illegal in a lot of places and very dangerous), an astronomer's camera, and some other random crap. 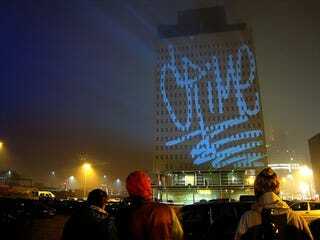 The L.A.S.E.R.TAG tracks the motion of the green laser through the camera and then projects the 'ink' onto any large flat surface—like in this case, the side of a large building. The lab has instructions on how to get started with creating your own tagging projector, and they've thankfully released the source code to help you on your way. But remember, even if you get one successfully built, you still need some art skills to properly do graffiti.